As I mentioned before in my sourdough waffle recipe that I knew once I added it to my routine, taking care of a sourdough start would be very simple and it is! They really aren't very picky. I am finding that I can care for my starter better then I can my houseplants. Which all seem to be dying while my start just keeps growing and I keep making tasty things will it. My main problem is I underestimate how much it will grow especially if I hide it away in the oven and forget about it. It was the first time I was excited to have a mess in my oven. After all we want it to rise! You can get a little start from someone you know who has one and just start feeding and using it. I prefer this method. A start that has been around for a while and is established is much easier to take care of and full of healthy living organisms. Some people even say their starts have been around for years and years, like it was a Great-Grandma's or older. And has been passed down for generations. Kinda cook I think! Or you can buy a dried start and reactivate it. (This would be my second choice) Cultures for Health is a great place to go to find all the traditional starts. I recommend this start if you are just going to be making whole wheat bread but they also have rye, spelt and brown rice starts too. And don't worry they come with instructions. Also their site is full of helpful info and videos. Last you could make your own. I have not ever tried this but I do know people who have. It just takes time and patients and a little luck having the right bacteria, spores and things starting to form. Basically you just mix 1/4 cup water (non-chlorinated) and 1/4 cup flour together in a gallon jar and put a cloth over it so bugs can't get in but bacteria can and setting it outside in a cool shady place where there are plenty of grass and plants around. Being outside will increase your chances of having plenty of friendly flora (good bacteria and stuff). Leave it out for 7 days feeding it another 1/4 cup of water and flour every day. Then put a regular lid on and keep it in the fridge for 7 more days still feeding it 1/4 cup water and flour. After 14 days, maybe a few more, if all goes well it should be fairly active and ready to start using and feeding normally. Okay so now that you have a start, you need to take care of it. Many people will tell you to weigh your ingredients or measure them. But just know it really isn't rocket science. I'm pretty sure Grandma wasn't real precise back in the day. I was good at measuring when I first began just to be sure I was getting it right but I soon could tell you could "eyeball" it easy enough. And now that's what I do. 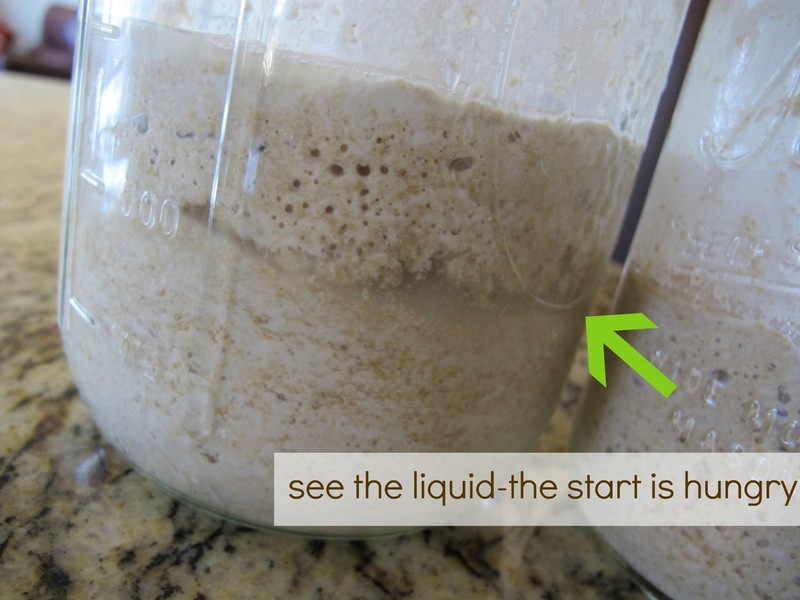 Mix the start and water together then add flour until it is the consistency of thick oatmeal. I have found a little on the thicker side makes a healthier start. Just that extra flour to feed on I guess. Cover and set on counter for a couple of hours then place back in the fridge or leave on counter if you use often. Feed at least once a week if kept in fridge or twice a day if kept on counter. I keep my start in the fridge because I don't want to feed it that often. Plus if you feed it that often (which it will need to be if kept at room temperature) you will quickly have A LOT of start that you either have to use or you have to throw out. So unless you are baking every day keeping it in the fridge is easier. When I know I'm going to want to make bread or something I pull my start out the day before, feed it and set it on the counter. I build it up, for example I start with 1/2 cup start and feed it. After a few hours it has proofed (meaning it's all bubbly, active, and has probably doubled in size and is hungry) I feed it again but this time there is over 2 cups of start so I add to it 2 cups of water and 3 3/4 cups of flour (see the formula 1 part, 1 part, almost 2 parts) and again cover and let it proof. You can use the start at this point if you want but it will make better bread if you feed it one more time. But if it had been in the fridge for a while before you started you may want to feed it a third time to be sure it's good and active. You will be able to tell by how bubbly it is and how much it rises. By morning you should have lots of start and can go to town making lots of bread or whatever else you desire. For most of my breads I use about 6 cups start. Waffles and pancakes and things like that I use 2-4 cups start. IMPORTANT: Be sure in all your baking that you save at least 2 Tablespoons - 1/4 cup of start that you can again feed and keep in the fridge. Liquid in or on top of your start means your start is hungry. Drain the liquid off before feeding it's basically its waste it is commonly called hooch. I will also scrape any dark and/or dry stuff off the top if needed this stuff is also discarded. Never put your lid on too tight, gas builds up in the jar and needs to be released. You don't want it blowing up. Think BUBBLES! The more the better. A happy start is bubbly. A start ready to use has bubbles all throughout. Be sure to give it a good stir when feeding, your start is alive and likes air. Glass or plastic is best used for the container some metals can react with the sourdough. You can use the same jar to keep your start in for a while but a clean container every month or so is a good idea. I certainly wouldn't get a new container every time that's way to many dishes! 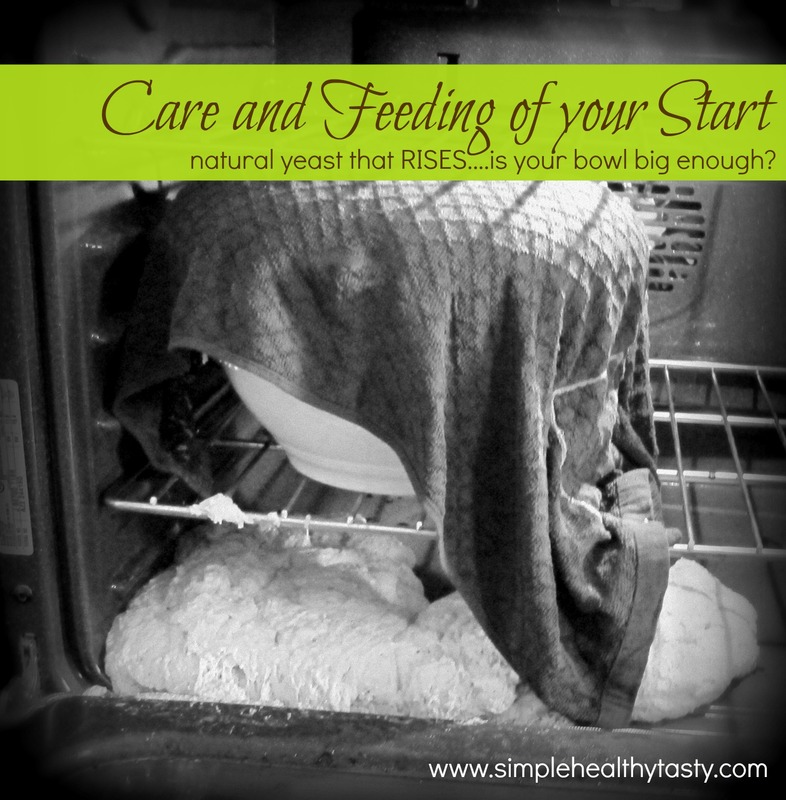 If your start seems to loose it's pep and isn't thriving; Reduce it down (meaning pull out about 2 tablespoons-1/4 cup and throw out the rest) and then feed it 2 or three times that day being sure it's in a nice warm place like on top of the fridge. This should perk it up if not try reducing it again, if it still doesn't work I hope you have a back-up start. See below. Always, always keep a back-up start. When you have some start that is at it's peak (meaning it has been fed and proofed, nice and bubbly) put some in a container and keep in your freezer. This should keep for about a year that way if your start ever piddles out or dies you have a back-up. Replace it at least once a year. You can also dehydrate some active start. Keep dried start in a airtight container in a cool dry place. Should keep for a very, very long time. Keep in a safe place and be happy knowing it's there just waiting in case you ever need it. So far I have not had to use my back-ups. I have both and I'm glad I do. There are some rumors of people who say they are gluten intolerant and/or have been diagnosed with Celiac who don't have a problem eating sourdough bread where the flour has "soaked". I'm sure it depends on the person and I'm not making any claims. But I have wondered if commercial rapid rise yeast might be a part of the reason so many people can't tolerate gluten....it hasn't soaked long enough? It takes at least 3 hours of rising time usually twice that to make bread this way. The flour is basically broken down and sort of predigested by the natural yeast. Something to think about anyway. I'm still not afraid to use some commercial yeast at times I think it has it's place depending on the person. Once I got my start going and active I started some in another jar. I like to always keep two jars going in my fridge and kind of rotate them through. Just seems to work for me. Wardeh at GNOWFGLINS is very experienced in all things sourdough/fermented she is my go to source for those things. Almost every sourdough recipe of hers that I try is good. I have her ebook Sourdough A-Z. I also have the book The Art of Baking with Natural Yeast . Do you use whole wheat flour or white flour? If you use whole wheat flour, does it matter how finely you grind it? Thank you! JuliebG: I use fresh ground whole wheat flour. I think it just needs to be a flour I like it quite fine but I think a little course would work too. Have you had any success with a traditional loaf? I've been trying off and on for a year and still can't get a good loaf. I love the pancakes, waffles, muffins, etc. but really want to be able to make a good traditional loaf of bread with this. Oh, and by the way, 2 tbsp is 1 ounce or 1/8 cup. Kathryn: I made a lot of bread. Some turns out much better then others. A lot of times it's more sour than I want it. I think I let it raise too long. The other thing is being sure it is kneaded long enough. I have an old bread mixer and I just don't think it gives it quite a good enough knead because most of the time my sandwich bread is on the crumbly side. One day though I let it knead for over 20 minutes and it was nice and flexible and moist. I have wondered about adding lemon to help activate the gluten. I will be sure to share our favorite recipes as we keep practicing. Practicing is right, sooner or later I'll get there. I'm trying to stay off of grains as much as I can, but my husband still eats the bread. I'm making a big batch of traditional yeast bread to get him by and will work on the natural leavened bread when I can. I think last time I didn't have enough flour, just not sure what the consistency should be compared to my regular loaves. I'll try letting in knead longer next time too. Too busy this week to worry about it. I've got a start and now after two days I have a gallon. We made pancakes this morning and the kids like them. I can't wait for you to post some more recipes. Also, I have read some about how/why to do this but what is the 'simple' explanation.... is it about soaking grains and fermented foods? Anyways, can't wait to hear more. Courtney: From what I understand the theory is that the reason your grains keep so well is because they are dormant and contain what is known as phytates. Soaking basically "wakes up" the grain and breaks down the phytates making it easier to digest and absorb the nutrients from the grain. And then yes the sourdough does contain good friendly flora that the gut loves and needs. It is pretty good too.